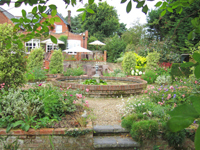 We aim to cater for the needs of visitors who require accessible disabled facilities at our North Norfolk Hotel Bed and Breakfast. The following statement is a summary of our provision. If you have any specific questions please feel free to call us and we will endeavour to help. The main train station is five minutes away by car, in Cromer or Sheringham. There is a local taxi service that has accessible taxis if required. Menus and Hotel information can be provided in large print by prior arrangement. We have an extensive website. On arrival to the property there is parking at the side and rear of the hotel. There is a designated disabled parking bay at the side of the hotel next to the Reception entrance, also two spaces on the front of the hotel and two spaces at the rear of the hotel. The surface is level and flat gravel with a slight downward ramp to main entrance. At the rear of the hotel the ground is level gravel with a ramped entrance to the back door, which is 91cms wide. The back door is locked at all times, however a key is provided. We can assist guests with any luggage and equipment. There are 2 sets of double doors which can be opened up fully if required, to 160cm wide. The entrance porch is a tiled surface and level. The reception area is carpeted and 2 metres wide. Our corridors to the ground floor bedrooms are 105cms wide. Corridors are well lit and have a good colour contrast between floor and walls. The flooring on all corridors is short pile carpet. There are two bedrooms on the ground floor, one double and one twin with accessible facilities. Breakfast is served in the conservatory on the ground floor. There are no steps it is all ramped. Furniture is flexible and can be moved to accommodate wheelchairs on request. There are blocks available to raise the table height. Chairs have no arms in the conservatory or bar area. Chairs have arms in the lounge area. We do play background music in the bar, lounge and restaurant area. There are 2 adapted bedrooms, both on the ground floor, one double and one twin. The door entrance and bathroom width is 90cms. Furniture is movable on request. There is a help button in both rooms, one in the bedroom and one in the bathroom. Flat screen television with text, Freeview and remote control. Your Personal Safety in the event of unseen circumstances. If for any reason you will need assistance, in the unlikely event of the evacuation of these premises, a display card is in your room and is to be placed on the outside of your bedroom. Door width 90cms opening inwards. Room is a tiled level surface into shower area. Room is 220cm x 320cms. Toilet is 46cms high with side support rail each side of the toilet. There is a static seat in the shower area which folds down from the wall. There is a movable shower chair also available. Help line button in wet room. The sink has paddle taps. We have a large garden which is accessible from the rear car park. It has level and gradient gravel paths, lawn and shrub borders and ornamental pond. A lawn table has a removed section specially designed for a wheelchair user. There is an upper patio area accessible by a ramped path. Lower patio area is accessible by level gravel and paths. Mobile phone reception is generally good depending on network. We are able to use five doors in the need of evacuation. If you require more assistance for evacuation please use the fire signs provided to hang on the bedroom door handle. We are a no smoking establishment but you may smoke in the patio and garden areas - ashtrays and bins provided. We have a fridge we can keep medication in if required. Hours of Opening: flexible to business but generally 7.30am - 11pm all year except Christmas Day and Boxing Day.